Last week saw the opening of the St Lawrence cruise season at Montreal and the first cruise into the Great Lakes by the 210-berth Saint Laurent. We also have a look at the goings on at TUI Group and its cruise arms, TUI Cruises, Thomson Cruises and Hapag-Lloyd Cruises. And Viking Cruises’ first upper premium ship, the 930-berth Viking Star, was christened at Bergen last night. The St Lawrence cruise ship season opened last Tuesday with the arrival of Chicago-based Haimark Line’s 4,954-ton 210-berth Saint Laurent from Charleston, where she had just received a $3.5 million refit for her first season of Great Lakes and New England cruises. The ship was built in 2001 as the now-defunct Delta Queen Coastal Voyages’ Cape May Light and although she has seen service in Haiti, Labrador and Chesapeake Bay waters, she has spent most of that time laid up at freshwater berths. Her present owners, Clipper Group of Copenhagen, also own sister ship Sea Discoverer, which is now in stationary use at Lerwick. Both ships are registered in the Bahamas. Something over 71,000 domestic and international cruise passengers are forecast for Montreal this year, representing an increase of more than a quarter over 2014, when the port welcomed 56,466 passengers. With calls by nineteen ships, Montreal expects a 2015 season that will also include five newcomers – Oceania’s 1,250-berth Marina and 684-berth Insignia, the 2,050-berth AidaDiva, 706-berth Saga Sapphire, and of course the Saint-Laurent. 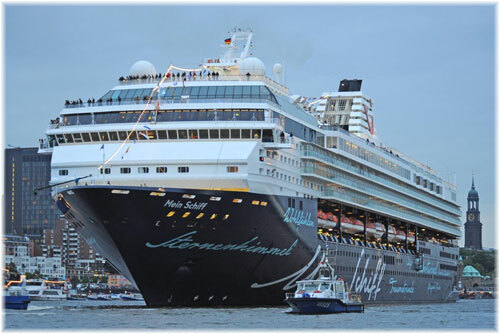 The largest carrier in the St Lawrence cruise trade at the moment is Holland America Line, whose 1,266-berth Maasdam trades from Montreal and 1,348-berth Veendam from Quebec. 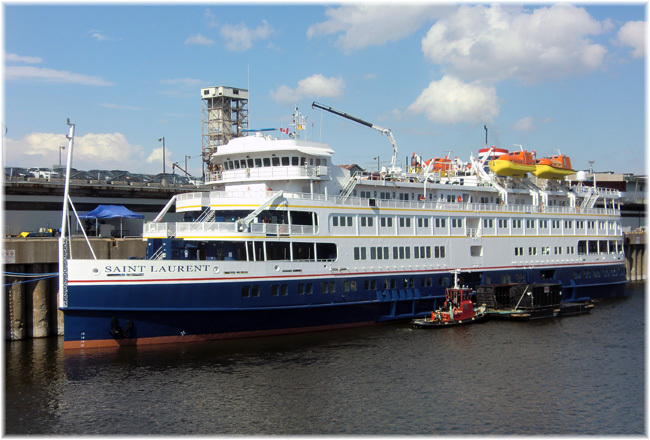 The Saint Laurent, which is using Montreal as its home port for 2015, became the first vessel of the year to take on passengers, setting sail on May 13 for a 9-night cruise to Clayton NY, Toronto, Port Weller (for Niagara Falls), Quebec and Trois Rivieres. She will perform ten such cruises for Paris-based operator Rivages du Monde. She will also offer 9-night Great Lakes itineraries between Montreal and Chicago and between Chicago and Toronto that will include all five Great Lakes by adding a brief lockage through the locks at Sault Ste Marie into Lake Superior. Port calls will be made at Chicago, Mackinac Island, Georgian Bay, Detroit/Windsor, the Welland Canal (for Niagara Falls) and either Toronto or Montreal. In addition to the Great Lakes, the Saint Laurent will offer a number of 9-night Canada/New England cruises between Montreal and Portland, Maine. The May 30 departure from Montreal to Portland will feature as guest speaker renowned US television commentator Dan Rather, and calls will be made at Quebec, Gaspé, Halifax, Yarmouth, Saint John, Bar Harbor and Portland. All Great Lakes and New England cruises have been scheduled for 9 nights. Outside cabins begin at $4,998 per person, including port charges, while inside cabins start at $4,598. TUI Group last week announced plans to retire the familiar UK brands Thomson and First Choice as part of a restructuring process, an exercise that is expected to take up to three years to complete. The move to a single TUI brand will also extend to the group’s five airlines, which have about 140 aircraft. The cruise fleet, which currently comprises 13 ships (four with TUI Cruises, five with Thomson Cruises and four with Hapag-Lloyd Cruises), will also be expanded in the next few years. Last week, Mein Schiff 4 was delivered to TUI Cruises, which itself is a joint venture of Royal Caribbean Cruises and TUI Group. The new ship will make her maiden voyage next month. Over the next two years, Mein Schiff 5 and Mein Schiff 6 will follow and TUI has now placed firm orders for Mein Schiff 7 and Mein Schiff 8, for delivery in 2018 and 2019. The latter will be slightly larger than their 2,506-berth predecessors with 2,860 lower berths. The recent announcement of the transfer of Royal Caribbean’s 1,804-berth Splendour of the Seas to Thomson Cruises has also signaled a modernisation of TUI’s UK fleet. 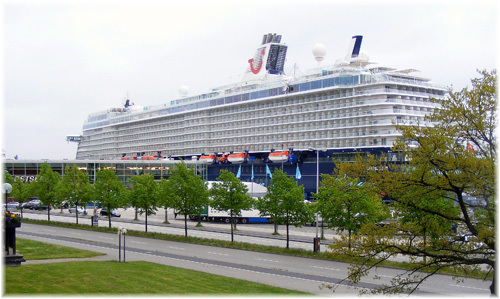 The next step, although firm dates have not been announced, will be the transfer of the 1,870-berth Mein Schiff 1 (ex-Galaxy) and Mein Schiff 2 (ex-Mercury), two former Celebrity units, to the UK. These two ships were the original units of TUI Cruises, where they began service in 2009 and 2011 respectively. Included in this restructuring, TUI is expected to announce plans to bring its Thomson Cruises and Hapag-Lloyd Cruises operations into the orbit of the TUI Cruises joint venture with Royal Caribbean, to gain cross-marketing and operational opportunities. 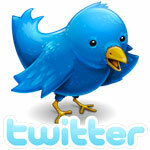 Exactly how this will be done has not been disclosed but the intention is to do this over the next two or three years. How the TUI brand will be applied to Thomson Cruises will be interesting as the TUI Cruises brand is already in use in Germany. In addition to the wholly owned Hapag-Lloyd Cruises, TUI still holds a 14% shareholding in Hapag-Lloyd Container Line. And while Royal Caribbean has a 50% shareholding in TUI Cruises, it does not own shares in either Hapag-Lloyd Cruises or Thomson Cruises. After a visit to London’s cruise ship mooring facility at Greenwich last week, last night saw the naming ceremony for Viking Cruises’ first ocean-going cruise ship, when the 930-berth Viking Star was christened in Bergen. Trude Drevland, Bergen’s mayor since 2011, served as the ship’s godmother. The day was also Norway’s National Day. The new ship is registered in Bergen and will compete primarily with Azamara Club Cruises and Oceania Cruises’ ships in the 684 to 1,250-berth range.